Discouragement is a natural part of living, and special care should be made to teach people how to use it. There was a sermon delivered many years ago, called "Saved by One," which showed throughout the Old Testament, how the seedline of Christ looked like it would be destroyed. Each time it looked like Christ would never be born, a remant of that family would be hidden, or saved. One aspect of discouragement is that of feeling all alone. "I am all alone. I and only I am here to carry out this work," moaned Moses. One of the basis for understanding how to live, is a truthful knowledge of the past. Attempts have been made to alter history and create a disdain for our founding fathers, and the values of our forbearers. If people can be taught to hate history, they will throw off the restraints of their parents and grandparents. If they believe that the clothing or customs of the past were ridiculous, they will embrace the styles and habits that are presented to the world as normal, without questioning them. If the past has been re-written and vilified, people in the present will have not use it for a reference for good. One blessing of the multi-generational family, including those members who have gone on before us, is the accumulation of knowledge and experience that will help future generations stick with the time-worn paths of righteousness. Told that history does not matter, and that everyone before them lived in a world of ignorance, people will be lifted up conceit, thinking that they alone have risen beyond the ignorance of the past. There can be nothing more ignorant than abortion, euthanasia, socialism, or communism. There can be nothing more ignorant than nakedness and immodesty, or serial dating and serial divorce. There is nothing more ignorant than the disregard of the aged. Our century embraces all this ignorance, and yet calls the past ignorant. "There is a generation: O how lofty are their eyes!" says the Proverbs. While every era has its error, the Bible is inerrant. If you are a follow of the Lord, your life is rooted in history. Your beliefs come from the past, and are lived in the present. You learn the doctrines of the Bible so that you can teach them to your children and your children can teach them to their children. You live in such a way as to influence generations ahead of you. If you have no children, your life still salts and lights those in your sphere. If your children learn to dispise history, they will despise you and your teachings, because you will be history to them. To make people scoff at the past, the modernists-progressives (a polite name for socialist-communist-marxist), need to create rumors and myths that, just by their own repetitiveness, will be believed, without the victims even knowing it. How many times, for example, have you heard someone say that women could not read, before feminism? This is simply not true. 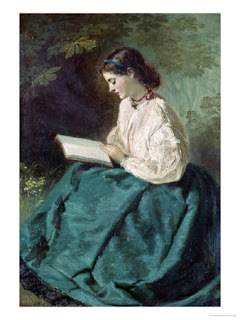 There were female authors and poets, even servants and indentured servants, who learned to read. 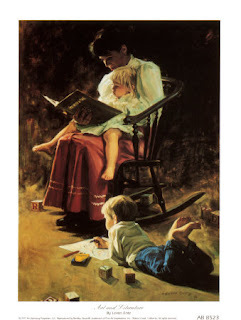 Mothers taught their children the word of God straight out of the Bible, long before the feminist movement. 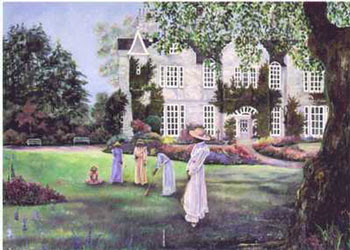 Remember the Dame Schools in colonial America? Jane Austen, wrote her stories before anyone "liberated" her. Female poets published their works long before feminists came on the scene. 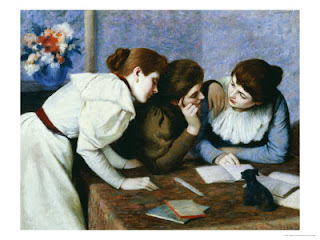 I have published works of women in early America, here, including Lydia Sigourney, who wrote books, as well as others, here on this blog. 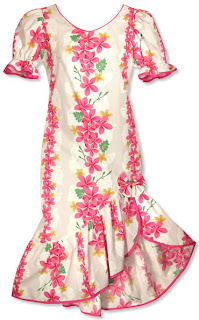 I would like to show some Hawaiian dresses from this site http://hawaiianfashionplace.com/SFNT.html The prices are $75 to $99. 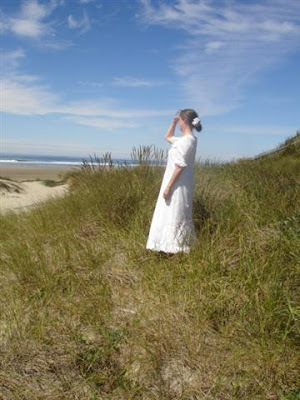 If you dont sew and want a cotton dress that can be worn daily and will withstand the wear and tear of the home, it is well worth the price. An apron worn at home can protect it. When you go out, just remove the apron. I love these dresses, and as a sewer, would certainly feel justified in charging these prices, for my time and effort. 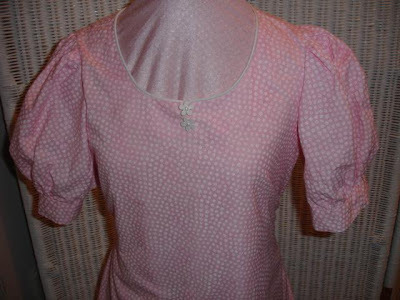 This cotton appears to be a higher quality than the kinds I am currently using for my home sewing, so if you do have to buy your clothes, this would be a very pretty, modest dress to have. 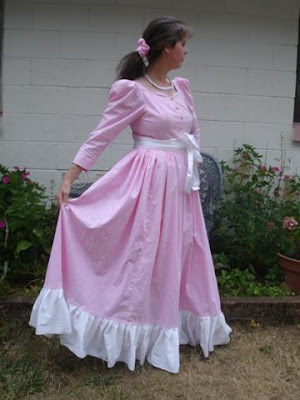 Before I found this site, I had cut out a dress similar to one of these, and bought piping for the neckline. I used that New Look pattern that has no zipper. Notice the hem line. This is thread drawn up to make gathers every few inches around the dress. A quilters fabric, 100% cotton, it is very soft, and does not need ironing . For want of a photographer, I can't post a picture of me in the dress, yet. 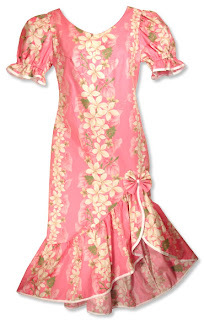 I certainly would have no hesitation in buying one of these gorgeous Hawaiian dresses. 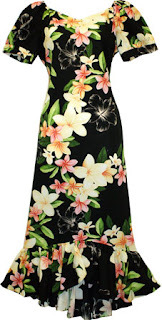 The fabrics are available here http://hawaiianfashionplace.com/hawaiian-fabric.html and are $12.00 a yard. You need an average of 4 yards to make a dress, more or less. If you left off the ruffle it would eliminate a yard or more. 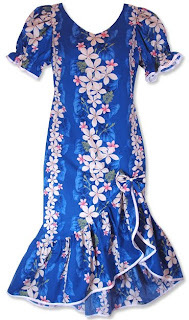 For Hawaiian style sewing patterns, go here : http://www.myriahsbazaar.com/VICTORIA-JONES-POLYNESIAN-SEWING-PATTERNS-s/80.htm You could immitate the style with one of the 99c patterns that you can buy at the fabric store when they are on sale. I have just attended a sewing day. Women brought their unfinished sewing projects, sewing machines and iron boards, and helped each other complete their garments. One young woman had never used a pattern, and needed clothing right away. She took big squares of fabric and draped them around her, and then sewed them together at the shoulders and sides. She then cut triangles of fabric from a burgundy curtain, and inserted them in all the skirt. 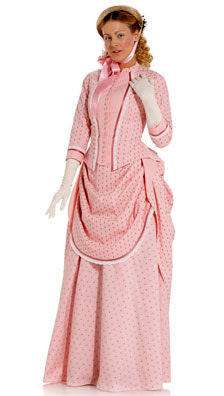 She made a wonderful dress that did not look at all unusual and yet was very long and elegant, and modest. She is an active young woman who raises sheep and yet she wears these beautiful long dresses that she makes.. 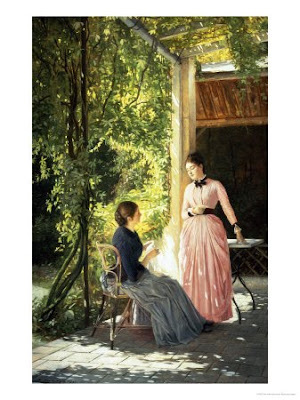 The dresses in the above painting, from the 1800's, look very simple, yet womanly and modest. Here again is an artists depiction of women's clothing, which shows the shorter length on the young girl, and the longer length on the older women. Girls at that time wore short dresses and wore their hair down. I have heard stories from my older relatives about girls begging their mothers to let them put their hair "up" and let their hems down. If mothers didn't want their girls to look too grown up too soon, they kept them in the girls clothing. I think that is interesting, in contrast to the styles imposed on women today. American women at home need clothing that does not catch on things. Pockets have to be placed so that they do not snag on the drawer handles in the kitchen or the door handles, as they walk past. Sleeves have to be roomy, but not too billowing that they snag on things in the home. They work in the kitchen a lot, and cannot have ruffled cuffs that would get in the way. Aprons over the dresses are a must. American homemakers are hard workers. They do almost every thing themselves, and so their clothing has to be simple. Because embellishments and jewelry, scarves and accessories get in the way and cut down on efficiency, clothing worn for homemaking has to be beautiful in a different way. That is why the cottons in the fabric stores are so appealing. They come in endless colors and patterns. You can use a pattern that is very very plain, but use a wonderful color or print. An American homemaker might plant a vegetable garden, water it by hand, weed it, and pick the fruits of her labors to make a salad for lunch or a pie for dessert. These things take a lot of time and work, and the clothing has to be protective, as well as pretty. She does her own cleaning and often sews for the home. 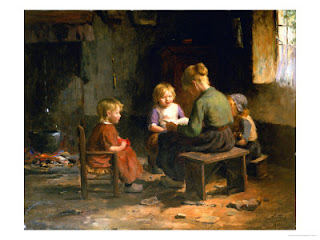 The American homemaker is trying to take care of her family and make a comfortable and peaceful home for them. Her clothing has to be something she really likes and enjoys wearing daily. 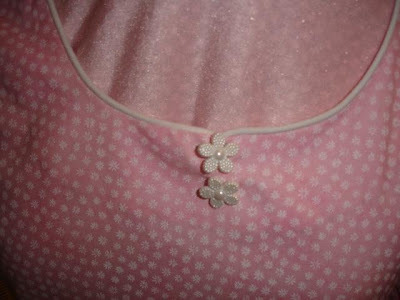 If it is too fancy, she wont wear it every day at home. If it is too shoddy, she will not feel she can wear it outside the home. 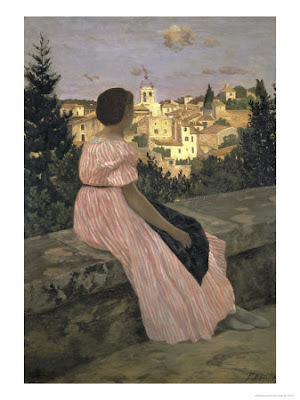 In this Painting-Inspired series, I have tried to show how a woman can work at home in a cotton dress and then go to the store or post office without changing. It looks good anywhere. 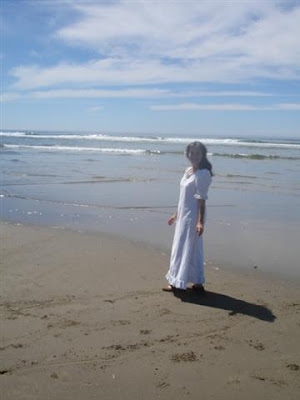 Clothing for the American homemaker has to be dignified and modest, yet a pleasure to wear. Beautiful dresses affect the mood. If the day is cold and gloomy, the color of the clothes can make a difference. If some jobs are difficult repetitive, having a variety of dresses to wear, can give her a lift. If there are great responsibilities, and monumental events in the family, the homemakers clothing can make every single day significant. 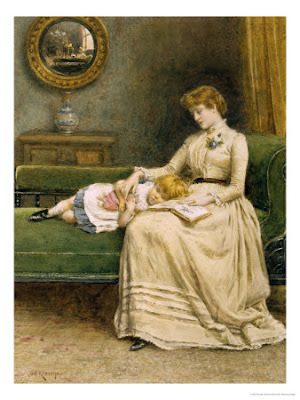 That is one reason I am showing some of these beautiful paintings of the past centuries. Historically speaking, this clothing was not just an after- thought. The clothing was sewn by hand, with great care. One woman recently told me that stitches on the seams were done in a special way so that you could not see the seams on the outside of the garment. That would require a lot of time. The dresses in the paintings look like something that could be worn today. 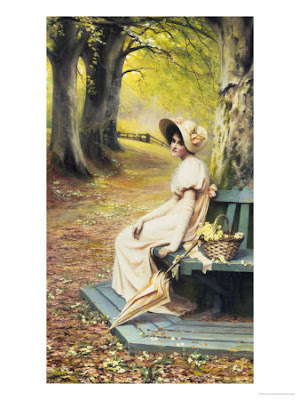 The garments in the painting would be good autumn dresses. The vivid leaves and the produce--pumpkins and squash in golds and browns and off-whites, and the burgundy colors, plus the darker greens, are good choices for autumn fabrics. 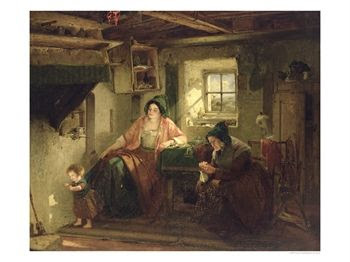 Thomas Faed painted rural scenes of Scottish folk life in simple moments. It was said of him that "his works were always noble." 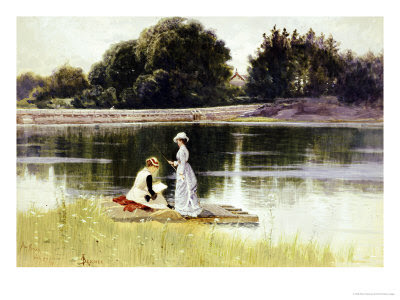 The artist Robert Herdman was one of his students. 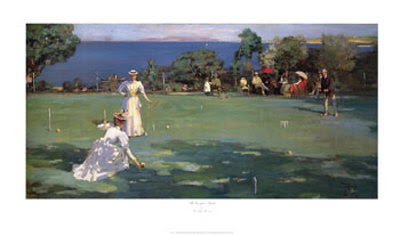 During his painting career, Mr. Fisher popularized the look of the American girl, in pretty dresses, engaged in many different activities, with a look of good health and vitality. John Faed was from Scotland. Some of his works can be viewed at the Glasgow Art Gallery. 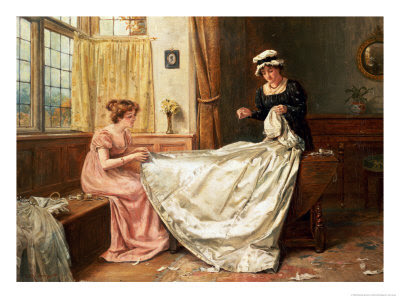 The clothing of the 1800's shown in these paintings, was probably hand sewn, with a needle and thread. 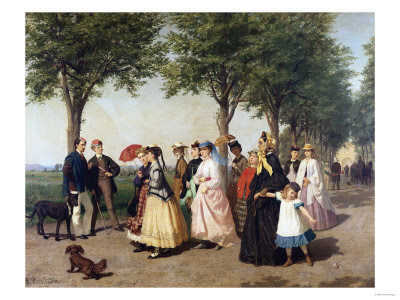 Shown here is a collection of paintings with women dressed in pink colored fabric. What I find most interesting is the length of a woman's dress. 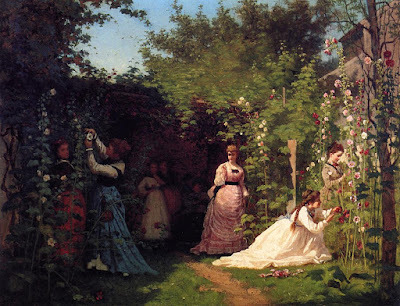 These paintings represent artists of several different countries, yet the women's clothing was long and beautiful. 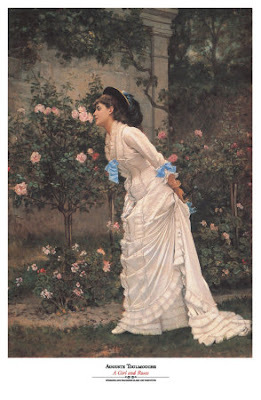 Charles Soulacroix was able to show the fine textures of silks and satins in his paintings. Some of his works are on display at the Lord Mayor's Collection in The Mansion House, London, England. Pattern from Burda, 2009 costume selection. Posters of these paintings are available at allposters, online. These Irish paintings are so colorful and interesting. The art of the era reveals something about the women's clothing worn at different occasions, from recreation to relaxation. 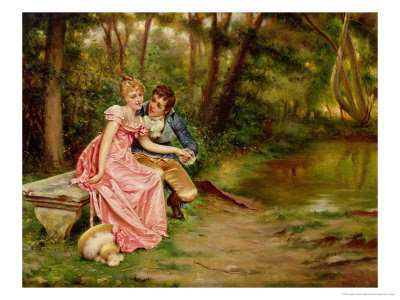 Nearly all these paintings have outdoor themes, and yet the women's clothing is long and soft looking. 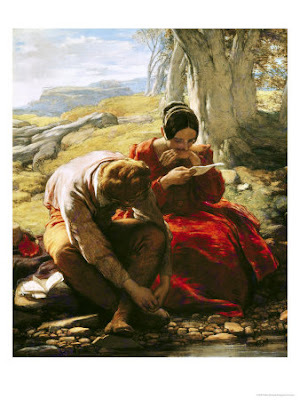 "The Sonnet", above, by William Mulready, captures the pose of a young man, looking over his shoulder to see the reaction of the young lady as she reads what he has written for her. 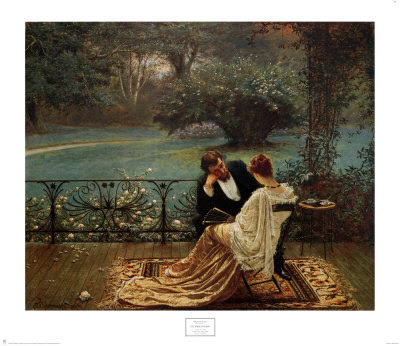 In "The Pride of Dijon,"it looks as though the man is intensely interested in the opinion of the woman. 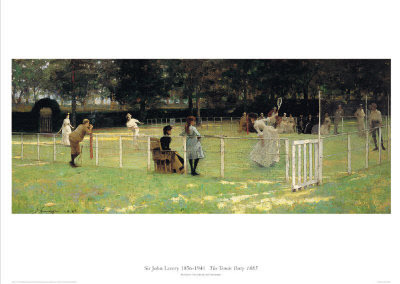 In the Victorian era, sports clothing was designed for women to be able to move and yet be modest. In general, people of that time believed in covering themselves so that they would not be offensive to anyone. 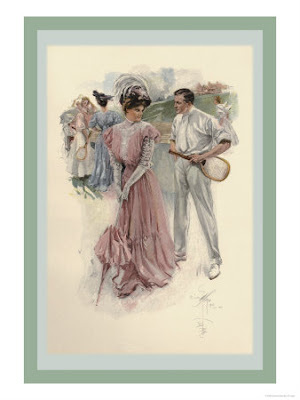 Summer clothing was actually thinner fabrics, and although the styles had a defined waistline, where the garments were held to the body, many of the skirts and blouses were loose, yet very stylish. Not all of it was the same, either, as you can see by the paintings of the time, which I have posted throughout this series. There was a great deal of variety and freedom of design, at the time. I do not see the modern manufactured designs as "freedom" because they all look the same and are limited to what designs are promoted that year. When you sew, you dont have to be peer dependent anymore. The pretty fabrics bring out what is close to a woman's heart. The beauty of the flowers, sky and sea, on the sentimental little prints of fabrics, say something about how you view life. Fabric is still as interesting today, if not more so. A trip to the fabric store or quilt store reveals a world of beauty that imitates nature. If you have a budding seamstress in your home, it is worth going to these stores just to browse and get an idea what fabric is available. If you find it too expensive, you can always get a small piece to take home and look at. 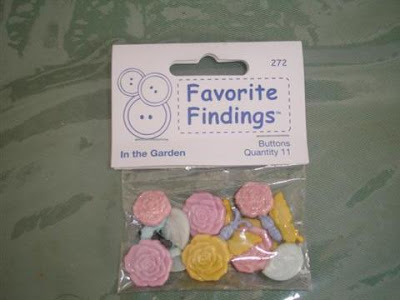 I am using up my buttons, and these matched the shape of the little white floral print on this fabric. 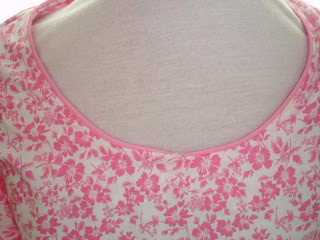 The neckline is trimmed with white piping, a nice contrast on this fabric. Piping has to be sewn on the seam line before the facing or lining is attached. This is all cotton, part of the Quilters Showcase collection. I added a piece on the hem and covered the seam with white bias tape. This is another dress made from the pattern with no zipper. It ties in back, and can be loosened for comfort. The sleeves are puffed, and not easy to iron, so I just leave them looking wrinkled, which ends up looking more gathered. This pattern has two main pieces: front and back, and is very easy. It took only a little white to sew and it is so comfortable. Copyright, Lydia Sherman. All Rights Reserved. I wore this dress to a back yard wedding ceremony. 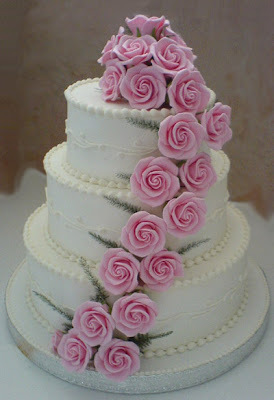 The bride made her own cake and supplied a tea menu with cucumber sandwiches, strawberries, and savory foods. The couple kept their wedding simple. We were the only guests. Coyright, Lydia Sherman. All Rights Reserved. The stairs in the bride's 1940's house. This dress will eventually be worn as an every day dress. These are short sleeves which I made a little larger at the cuff, for the hot weather. Most sleeves are too tight, and sewing your own clothes gives you the option of making things looser. 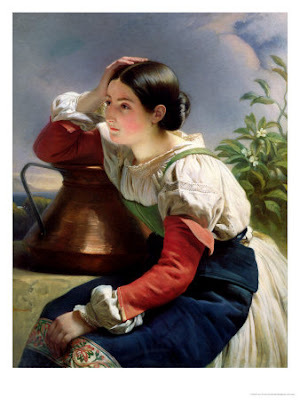 "Young Italian Woman at the Well"
This is an interesting garment from the 1800's, and the color is splendid. Many of the paintings of women in the past centuries are placed against exquisite natural backgrounds of flowers, rivers, skies and seas. 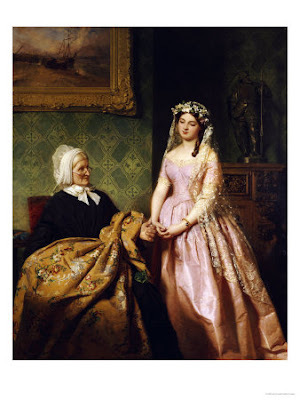 Winterhalter was the artist hired by Queen Victoria's family, and his portraits are considered historical records. 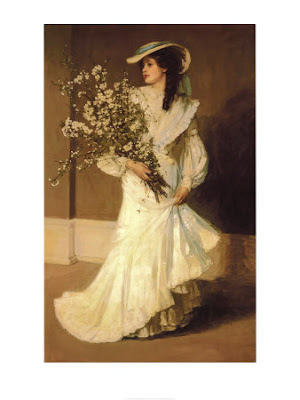 If you live in England, you might be able to find a gallery where his paintings are on display. They were in our country a few years ago, and many people who attended said they were just exquisite to behold up close. The photographs I use here are nothing, compared to the quality in reality. 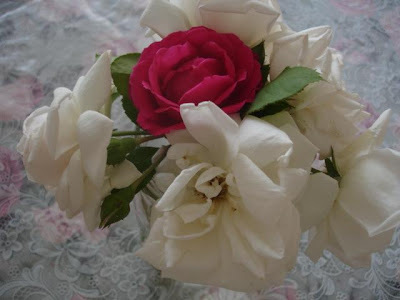 These flowers from the garden have a similar color as the painting, above, and give me some good ideas for color combination in sewing. You can get inspiration all around you, and I believe that sewing your own clothing is 50 percent inspiration. 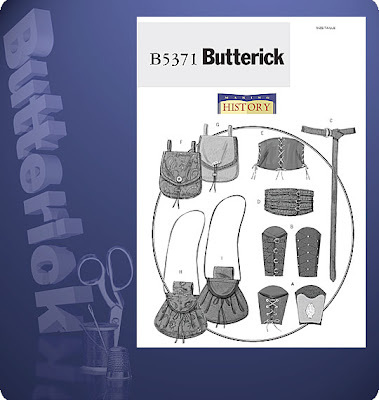 Here is a pattern in the costume section of the Butterick patterns, that shows the sleeve covers. These patterns will be going on sale soon, for $1.99 or 99c. I never buy a commercial pattern for more than that. I do buy speciality patterns made by private companies, like Sensibility or Smoke and Fire, or Wendy's at full price, but they are made of better paper and last much longer. Sewing hint: Sew neat. As you cut out each piece, fold the pattern and put it away. I keep mine in a large zip lock plastic bag. Dispose of small scraps as you cut. Put larger scraps together and keep neatly near your machine. There is no need to clutter the entire home with a sewing project, if you neaten and clean as you sew. Each project should be small enough to put on a little folded table or tv tray near the sewing machine, or a basket, out of the way. Take a break after completing the cutting out portion of the project, to go to the main parts of the house and pick up clutter and straighten. Keeping surroundings orderly makes the sewing more relaxing. Observe which sewn garments you tend to wear the most, and use that pattern often. This white one with the antique gathered cotton lace that a sweet friend sent me, seems to be the one I wear the most. 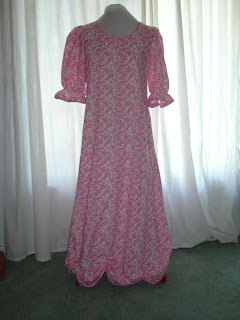 It has the under dress; the slip with the sleeves, and it has no ties or waistline. I cannot recommend the slip, enough. Because of the slip with sleeves, the dress rarely needs to be laundered. That slip will prolong the life of all the dresses, and I would suggest you make one of them first, as a try-on model for a dress, from white muslin. 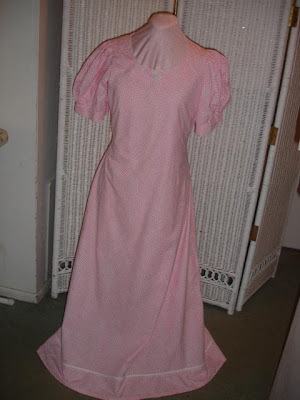 That way, if it does not work out exactly as you like, you can still use it for a slip or night gown. 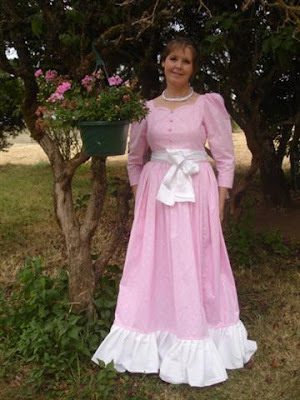 The slip and pattern suggestion are on this post http://homeliving.blogspot.com/2009/07/alfred-augustus-glendening-1861-1903.htmlThis is the most comfortable dress, and does not stain easily. As long as it is, even with the added ruffle at the hem, it never touches the ground. Do not duplicate these privately owned photos or place anywhere else on the web. I have been reaching for this dress more than any other. 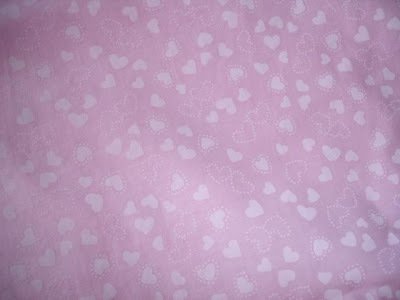 It is made from Quilters Keepsake cotton; a flocked print with white hearts. Because the garment is fairly loose, it does not seem to wrinkle, and I have not had to iron it, so far. The under dress, or slip that I made to go with it, helps it to fit well. 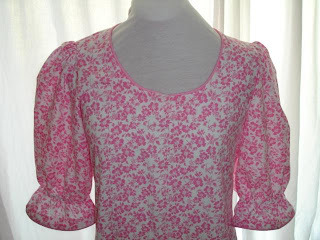 I will be making more of these with different kinds of sleeves and necklines. 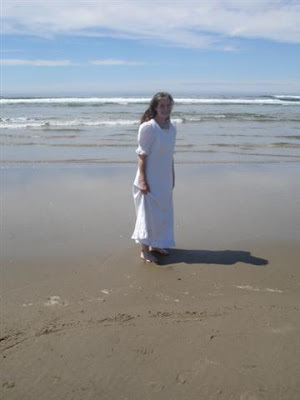 I wore this dress to shop, to tea, and for a walk on the beach. I am enjoying the pattern, and would like to try different colors, sleeves and trims. This Keepsake Quilters flocked white fabric also can be dyed in whatever shade you like. Here I have tried a piece of it with a light rose fabric dye. It makes the print appear more distinctly. Some viewers have inquired about lotions and creams for the face and hands. I recently sampled a product from a family business and would like to recommend it. I especially liked the spice scented hand lotion...mmmm. It smelled like cinnamon. It contains no mineral oils, no parabens, and no petroleum products. To order, go to http://www.countrylotions.com/ I also have used other products and scents from this line, to great satisfaction. This is an "anonymous only" blog, so please do not post your identity or your blog name. It protects your privacy and eliminates online identity theft. Prints of these paintings are available at Allposters.com, of which I am an affiliate. 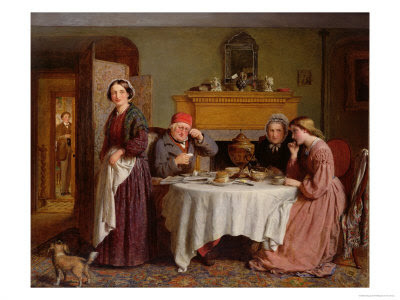 Portrayed here are a few more artists of the 18th and 19th century and the women's clothing. 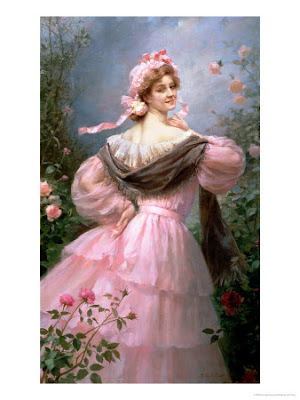 Since I am sewing up any pink fabric I have, I was interested in the pink garments in these paintings. The artist biographies , dates, names and nationalities will be posted later. Sewing hints: When you arise in the morning, get dressed as though you are ready for business, fix your hair and put on real shoes. Put a huge container of wonderful stew or soup on the stove and some kind of bread in the oven, as well as a big salad in the fridge. That way, meal times are easier and you can sew, uninterrupted for the day. Clean up the house in the cool of the morning or in the evening before bedtime, and leaves the major part of the day more free for sewing. 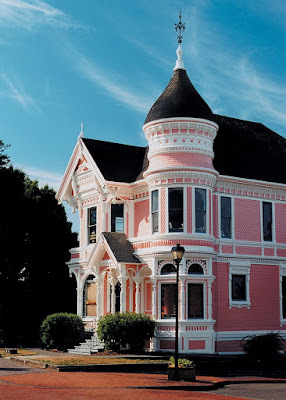 Pink Lady Victorian 1880 , Redwood Coast, California from "Divine Wedding Cakes"
I posted the house and cake to show that color ideas for clothing can come from different sources, although most of these sources actually are inspired from the colors of nature. 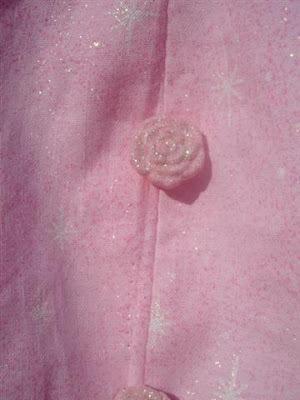 Each of these packets has a few glittered rose-buttons, which I used on this sparkly dress. This is 100% cotton fabric, with a glitter glaze and a white star print all over it. The glittered fabric seems to be stronger and last longer, getting softer as it is washed and worn. It does not have much "give," so it needs patterns which require wovens. 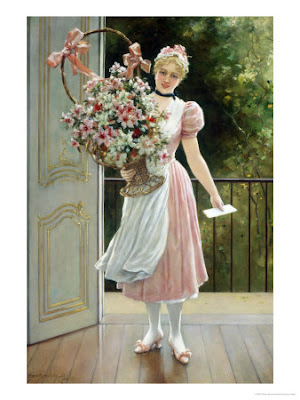 If you are always a bride and never a bridesmaid, you have probably been married quite awhile. 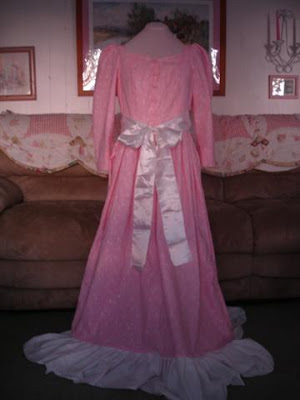 I thought it might be fun to have a bridesmaids dress, using the Laura Ashley pattern, from the 1980's, McCalls 8909. 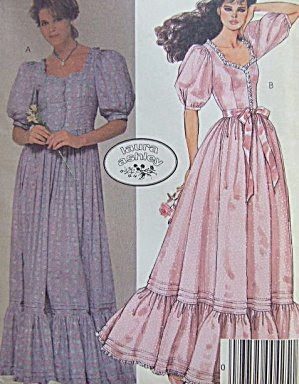 This is a vintage pattern and you can still purchase it in various places on the web. It is not for beginners. The garment was, in my opinion, very difficult to sew, --that is why it took so long, but I liked the picture on the envelope.. If you attempt this, use some thin cotton, and follow the directions to the letter. There was not enough fabric for the ruffle, so I used muslin. Do not lift or remove this picture or place it anywhere else on printed material or the web, without permission from me. All rights reserved. To imitate this look with an easier pattern, try New Look 6586. Lengthen it when you cut it out, and add a sleeve from another pattern. This pattern sews up much more quickly. If you have only a few yards of fabric, use the New Look 6352, add a ruffle around the neckline, add a sleeve and a ruffle at the hem. It is easier to sew, although, in my opinion the NL 6352 has some fitting flaws (but still you can wear it, which is better than what you have in stores) . Try also the Its so easy 2901 Simplicity, as it fits better. The ideas are to inspire a type of look, and you do not have to follow them exactly. Do not lift or remove this photograph without permission from me. All rights reserved. Today, I would like to recommend Pandora Radio (its free) on your speakers, from the web, the following: Liebestraum no. 3 Notturnos for Piano, by Franz Liszt by London Philharmonic Orchestra. Let me know how you like it! For your own protection, and privacy, please do not reveal your blog link. Please post Anonymously or make up a name to distinguish yourself. Cyber stalking is a serious problem. Please protect yourself.